Today's NOTD is a little bit of nail art - I've been really slacking on the nail art front lately, and wanted to get back into it. I really love how these roses turned out, and I actually have a tutorial (broken link removed) on how I achieved them over on Cas's blog, Serenity of Beauty, so please pop over and have a read if you want to find out how to do these! 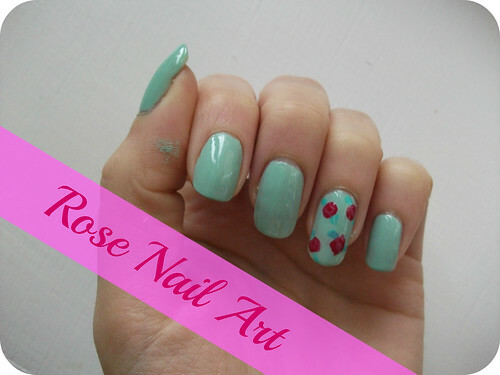 I hope you like my rose nail art, and please do head on over to Cas's blog to have a peek at the tutorial! I'd love to see your attempts if you decide to give this a go. Have you ever tried rose nail art? What colours would you use? love everything to do with roses, this looks really pretty, might have to give it a try! I wish I was more into my nails ): this is a really pretty design but I do not think I'd be able to pull it off (: Great post! So cute! :) I usually paint my nails white and then make the roses and then do the leafs. I think I have a picture up on Instagram if you are interested seeing the design. Just found your blog! I am now following. I look forward to keeping up and reading more. So pretty :) I need to do some nail art, it has been ages since I last did some! Love the colour of the roses against the base colour. Gorgeous nail art! oh thats so pretty!! I love the new trend of having your ring finger different to the rest of the nails, and it looks great! the colour is like a gorgeous sky blue and such pretty roses! I have to admit to being scared of nail art - each time i try it i fluff it, and i know its all about practice, practice, practice, but i have hardly any patience!! BUT when i see posts like this, it really makes me wanna give it a go, im gonna be checking out the tutorial!